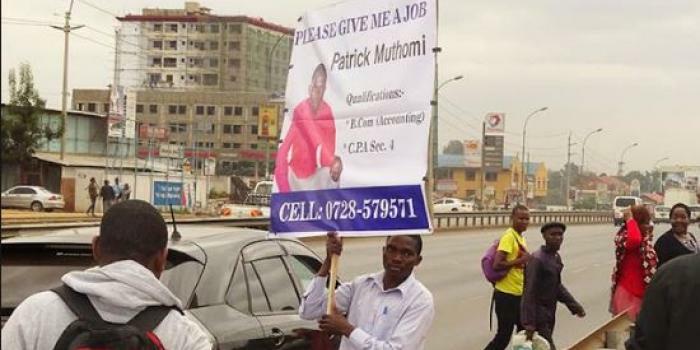 A few weeks ago,28 year old Patrick Muthomi made a bold step by standing on the streets of Nairobi while lifting a placard complete with his qualifications in a bid to look for a job. He received numerous calls from well-wishers who were willing to help him secure a job. Well,looks like his efforts have finally paid off after he got hired by Chandaria Industries. The B.Com graduate said that he secured the lucrative job after managing to tackle a practical question posed to him during an interview at the multi-billion company. Next articleDiamond and Zari expecting a son!